When the Cardinals recently unveiled their new home alternate jersey and announced some other uniform tweaks, the guy emceeing the event was team president Bill DeWitt III. A few hours after the unveiling, I was made aware that DeWitt happens to be a Uni Watch fan and that he’d be open to discussing the Cards’ uniforms with me. By the end of the afternoon, we were chatting on the phone. DeWitt isn’t like any other baseball executive I’ve ever encountered. Less than two minutes into our conversation, he casually mentioned Marc Okkonen. He has a graphic arts background (as well as an MBA from Harvard), and he’s had a large role in the design of the Cardinals’ new ballpark and the team’s championship rings. As you’ll see in this transcript of our discussion, he Gets Itâ„¢ — he’s one of us. Uni Watch: How big a role did you personally have in the development of this new alternate uniform design? Bill DeWitt III: A big one. I led the whole effort. UW: What sorts of things did you consider along the way that ended up on the cutting room floor, so to speak? BD: Going back a bit, when we redesigned our logos in 1998, at that time we’d been using a circular primary logo with a cartoon bird. I always thought it was crazy that we had a cartoon bird for our primary logo and a different kind of bird on our uniform. That led to a redesign of the bird, which we then used on our uniforms and for a new logo and for some other things. It was a good refresh of our brand at that time. In the 14 years since then, there have always been little things about that 1998 redesign that bugged me, but none of them bugged me enough to go through the effort of changing them. Along the way, though, I gathered ideas of things I’d like to see. I love that [placket] piping on old retro jerseys, I love the old “St. Louis” script we had back in ’32, I love off-white cream jerseys that teams like the Giants, Phillies, and Indians have used. And I thought, rather than messing with perfection by altering our home and road jerseys, let’s have an alternate jersey that incorporates some of these older, archival elements that go well together. So what didn’t we do? At one point there was some thought about doing a black bat, instead of yellow, because that’s what we used to have. We considered doing the really thick piping on the shoulders, we could have done belt piping, those types of things. But you don’t want to overload the Christmas tree. UW: In the announcements and press releases and so on about the new uniform, there were these quotes from you, and I could almost feel the tension between your desire to be thought of as one of the old-school franchises that don’t dabble in alternate uniforms, like the Yankees and Dodgers and Tigers, while also wanting to do something new. Was that a difficult internal conflict for you? UW: I’m sure your wife will be happy to hear that comparison. BD: I should be okay as long as she doesn’t read Uni Watch. But to get back to your point, yes, there’s some tension there. 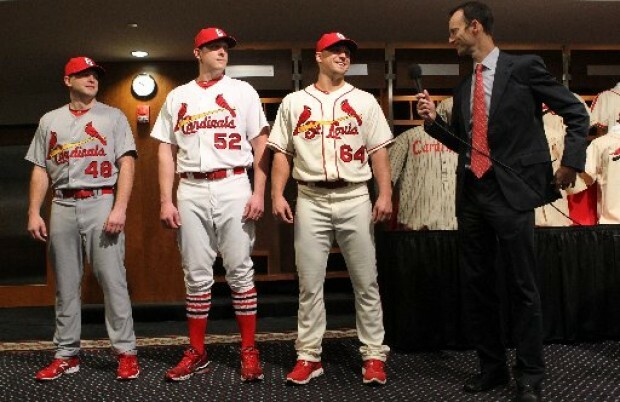 But the announcement “Cardinals Do Third Jersey” — that’s not the whole story. Once people see the jersey, they’ll see that this is still in keeping with who we are and what we’re about. UW: I’ll tell you one aspect of the design that disappoints me: Although the overall design is very retro, the birds on the bat are the exact same birds, in the exact same poses, as the ones on your home and road jerseys. Since the inspiration for the jersey comes from the early 1930s, why not go back to the version of the birds on the bat that was used in that era? BD: You’re referring to the tails-up birds, as we call them. And it’s funny you say that, because we gave that a little thought. But remember, this isn’t a throwback — it’s a modern uniform, and it’s part of our portfolio of modern uniforms. The guys are gonna be wearing it every Saturday. So for that reason, I thought the birds had to be modern. Also, we have this enhanced stitching technology that allows for better detailing of the birds themselves, and we think the modern birds showcase that better than the tails-up birds. And then finally, those older birds are much smaller, and that causes problems with the proportion of the birds compared to the script and the bat. So you’d either have to enlarge the birds, in order to fit the modern size of our bat and script, or you’d have to shrink the bat and script. So it’s a good thought, but it has a bit of a Pandora’s Box element to it. UW: There’s a lot of confusion among my readership regarding this “enhanced stitching” and how it differs from the old-school chain-stitching that you guys have used. Can you clarify that, and are you still using chain-stitching? BD: We are clearly using the old-school method. It’s still direct-embroidered chain-stitching, the same way it’s always been done since 1922. It takes them longer to do one of our jerseys than any other MLB jersey by far — about an hour. UW: So what’s the “enhancement”? BD: I’ve been trying to get more information from Majestic on that. I’m not sure if it’s still 100% hand-done from scratch, or if the machine does part of it now. But if you look at the graphic version of our logos — like on a computer or on a printed page — it has more detail than our chain-stitched uniforms, and until I recently I always thought that was just the cost of doing business with chain-stitching. Early this year, though, we were pushing Majestic to tighten up a few other problems we’d seen. Basically, they were getting sloppy: The wings were kinda sticking out funny, the birds were drooping, the beaks didn’t look right. So we were pushing them on that, and then I asked for a sample showing that they’d fixed all these things, and it came back just unbelievably more detailed. Like, I didn’t even ask for that! It didn’t just tighten up the problems we had singled out — it went way beyond that. It completely blew me away. That was really the impetus to go ahead with this new third jersey. Every year, MLB Design Services is on me — “Okay, if you want to do something new, it has to be ready by March 1st.” And every year I said, “Nah, we’ll wait another year.” But once I saw this sample with the enhancements, that was it. Now we could do the alternate, improve the home and road, the whole thing. UW: As long as we’re talking about small details, one thing I’ve always found amusing is the color of the birds’ beaks. You show them in yellow. And there was that one time when you made them red, and of course that’s more accurate, because a cardinal’s beak really is red. But man, there’s no denying it, it looks so much better in yellow! BD: It’s funny you say that. 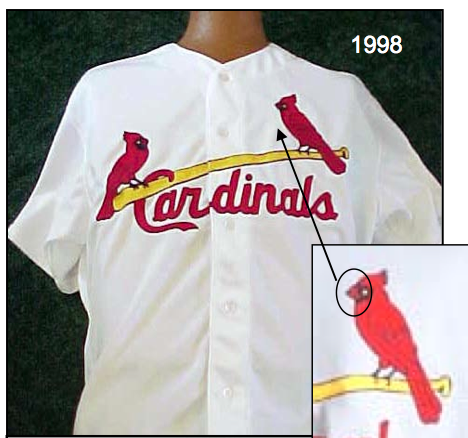 That was part of that logo redesign in 1998 — I lived in suburban St. Louis, and we had bird feeders, and I saw lots of Cardinals, and their beaks were red, so I said, “Let’s change the beak color, to make it ornithologically correct.” And we made the eye yellow, just to keep some yellow in that area of the design, to go along with the yellow bat. So we did it, and I soon regretted it. 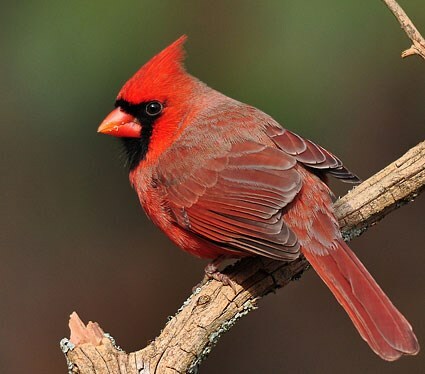 And then, lo and behold, I started noticing that about 10% of cardinals actually do have much lighter-colored beaks. BD: Every cardinal in every team sport has a yellow beak. But seriously, I have seen actual cardinal birds with beaks that are really close to yellow. Like, you wouldn’t call it yellow, but yellow-ish orange. They’re rare, but they’re out there. We can kinda hang our hats on that: These birds are rare, and the Cardinals are rare players. UW: One thing I’ve noticed in recent years, and my readers have noticed it too, is that the birds on the bat insignia seems to be sitting lower and lower on the jersey. And this isn’t just an optical illusion — some collectors have done measurements, and its position has clearly been lowered. First, why has that happened? And second, is that why you made the front uniform numbers smaller, because the space underneath the bat has gotten more compressed? 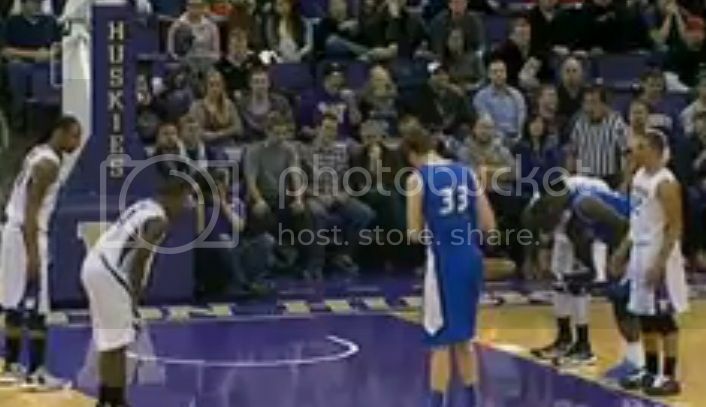 UW: Their front uniform numbers were getting tucked into their pants, right? I’ve noticed that too! BD: Yeah. It was really annoying. That was one of those little things we wanted Majestic to fix. UW: So that wasn’t intentional, at least not from your perspective. BD: No, that was something that slipped over the years in terms of quality control. Even if they hadn’t come back to use with the enhanced stitching and all that, at some point we would’ve pushed for them to move the logo back up on the jersey. UW: So that’s fixed for next season? UW: Okay, then that’s not why you’re making the front uni numbers smaller, since you’re restoring that space under the chest logo. So why are you making the numbers smaller? BD: It just felt out of balance to me, especially with double-digit numbers. And we don’t have many single-digit numbers left, because of number retirements. I just thought it competed too much with the birds. And this wasn’t a new problem — if you look at old photos of Bob Gibson, that “45” is so big, it dominates. You don’t even see the birds. So we made it a little smaller in ’98, and now we’ve made it a little smaller again. And now I think it’s finally perfectly proportioned relative to the rest of the logo. UW: Let’s talk about the road uniforms. You’re going back to wearing the red cap on the road, right? BD: Yes. But we’re keeping the blue hat in our portfolio as an alternate. At the moment, we’re kind of indifferent to how it’s used. It could be used as a Sunday-getaway cap; it could be used just when we play other teams that wear red, as a point of differentiation; it could be worn on alternating road trips. We may actually get some fan feedback on this. UW: Most teams are busy adding new caps. Why did you decide to eliminate one, or at least downgrade its status? UW: You must love spring training, because you guys always wear the red caps on the road for Grapefruit League games. BD: Yes, I love how that looks in spring training. Another problem with our road look is you have blue hat, blue belt, red shoes. And I’ve gone down that road of asking, “Can’t we get blue shoes, or dark blue?” And then you’re told, “We don’t control the shoes — the licensee does. So you could make the licensee provide blue shoes, but they’re all gonna be different, because one guy’s Nike, one guy’s Reebok.” So you’re really putting the equipment manager in a tight spot. Basically, life’s too short on that one. So I gave up that fight a long time ago. UW: So instead, you’ll change the cap. Will you change to a red belt on the road too? BD: Yes. Red cap, red belt, red shoes. So now all our accessories will match. And when we do wear the blue hat, we’ll use the blue belt, but we’ll still have red shoes. UW: Speaking of the road uniform: Since you’ve now come up with a “St. Louis” script, for the alternate jersey, why not put St. Louis on your road grays, instead on the new home alternate? BD: Great question. And that was my original thought, to wear “St. Louis” on the road. It certainly would make it more consistent with the way other clubs do it. 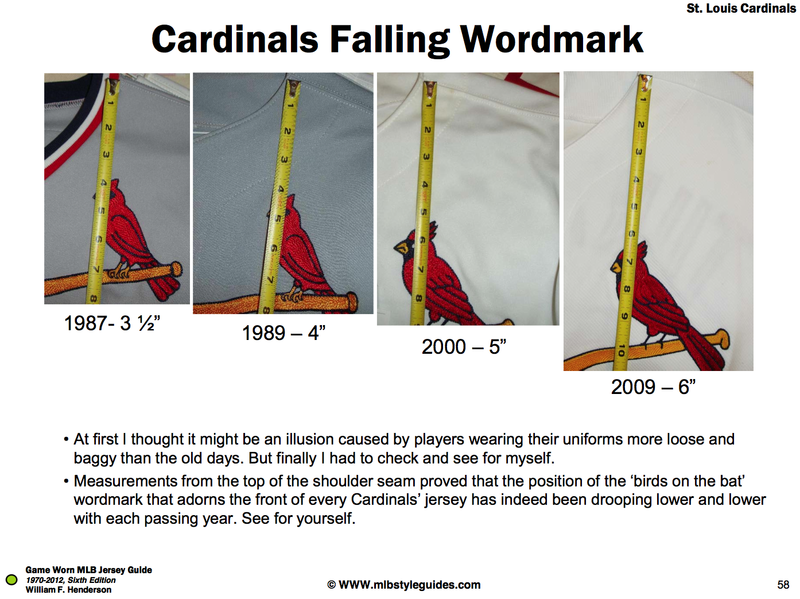 But remember, we’ve had “Cardinals” on the road jersey for longer than most teams have even existed, so I don’t think we just have to do what everyone else does. Also, if we put the retro “St. Louis” script on our regular road jersey, are we also going to put placket piping on the road? Are we going to use the cream-colored fabric on the road? We had all these elements [including the retro “St. Louis” script] that I thought made sense as a kind of montage third uniform, and I thought it looked cleaner and tighter keep all of these retro elements together as a home alternate, while keeping our tradition of wearing “Cardinals” on our home and road uniforms. I mean, everyone knows we’re from St. Louis. UW: Yeah, you’ve said that before. Are you aware that some fans think there’s a certain cockiness, or even arrogance, in that last statement? BD [laughing]: Okay. I guess that’s fair. But here’s another thing: I always like it when the cap represents the city and the jersey represents the team. So our cap and jersey spell out, “StL Cardinals.” Just like “SF Giants” or “NY Yankees.” [Slight pause.] Wait, they don’t actually do that — they’re “NY NY.” Which is one of my problems with the Yankees. UW: And for their road look, which would be “NY New York,” you see that as redundant? BD: Yes, that’s redundant! I don’t like redundancy. So this is a pet peeve of mine. It’s a quirk, even though nobody else probably cares. Well, probably you do. Anyway, I love how that “StL Cardinals” flows and makes sense, and I think that’s just as valid on the road as it is at home. UW: What’s the situation with the Sunday cap? Is that being retained? UW: One last question: You guys have these gorgeous striped socks, but most of your players wear their pants down around their shoetops. Does that bug you? BD: Uh, yes. [Chuckles.] Didn’t you already know the answer to that? UW: I hoped I knew the answer to that. BD: But you know what’s really great about our current team? The vast majority of them feel the same way. They did this “Getaway Socks Day” last season — I think six of the nine guys out there did it, and it really looked great. I think the peer pressure’s starting to build. I’m hoping for a day when they all do it. For me, it’s a great look, but I actually find it bothersome if only one guy does it. It exposes a lot of color and really changes the uniform. BD: Let’s put it this way: I’d prefer that everyone does it one day a week, and then nobody does it the rest of the week, instead of a few guys doing it here and there once in a while. ESPN reminder: In case you missed it yesterday, the annual Uni Watch Holiday Gift Guide is up now on ESPN. And if you’re intrigued by Sean Kane’s painted baseball gloves (the first entry on the Gift Guide list), you’ll want to check out this interview with him. Live presentation reminder: I’ll be doing a live lecture/slideshow thingie about the Permanent Record Project next Wednesday, Dec. 5, 7pm, the Housing Works Bookstore CafÃ© in Manhattan. Admission is free. Details here. Uni Watch News Ticker: NC State will wear Jim Valvano tribute jerseys next week in the Jimmy V Classic. … Vince Moore sent along a great photo of himself and his big brother, Van, wearing their first baseball jerseys, which they received as Christmas gifts. 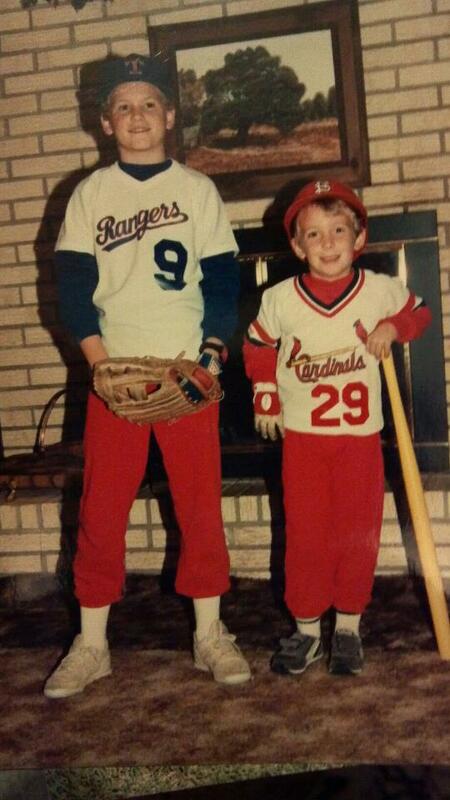 “I’m the Cardinals fan (#29 for Vince Coleman), and my brother is the Rangers fan (#9 for Pete O’Brien),” he says. “The 2011 World Series was a big deal for us!” I love how the uni number on Vince’s jersey is almost as big as the chest insignia. … Remember when American League umps wore maroon blazers? One of those uniforms is now up for auction (from Bruce Menard). … Are the Sacramento Kings moving to Virginia? Maybe. “Seems like it’d be good news for the uni-verse as the Kings have nowhere to go but up,” says Sam Belk. If the Kings move, it would also mark the sixth incarnation of this franchise, following the Rochester Royals, the Cincinnati Royals, the Kansas City-Omaha Kings, the Kansas City Kings, and the Sacramento Kings. … Speaking of the Rochester Royals, check out this 1945-46 team portrait. The guy in the front row, third from the left, is none other than Otto Graham! I hadn’t realized that he played basketball as well as football (from Leo Strawn). ”¦ I don’t know anything about the show Go On, but David Muir provides a uni-centric overview: “Matthew Perry plays a sports talk radio host, and his producer doesn’t know that much about sports. In last week’s episode, Perry’s character decides to help the producer appear like he knows about sports and gets him a hockey sweater of the new Slovenian prospect who’s going to tear up the league.” … Get this: When Arizona wore solid-red against Arizona State last weekend, ASU had wanted to wear solid-black, but their request was denied (from Duncan Wilson). … In the latest example of advertising encroaching where it doesn’t belong, the Houston Police Department used some yellow crime scene tape imprinted with the URL of a floor-coating company (from Paul Kennedy). … Here’s a great half-hour video about the NHL from 1917- 1967. “There’s some really cool footage featuring all kinds of old NHL uniforms,” says Scott Barkett. “Beyond that, it’s got a bunch of interviews with guys like Conn Smyth, Jack Adams, etc. They tell some really cool stories, including one about Gordie Howe being upset he didn’t get a Red Wings jacket that he was promised in his contract. What a difference from today!” … How close was Shane Doan to becoming a Flyer? This close (from John Muir). … Rick Reilly said Notre Dame had no chance of beating USC, and that he’d go to South Bend to shine helmets if they pulled it off. He has now made good on that pledge (from Warren Junium). … You know those 1970s NFL helmet plaques that Brinke is always featuring in Collector’s Corner? Patrick Sharon has found something similar, only for hockey. Never seen that before. … Reprinted from last night’s comments: The Ravens will wear their black alts this Sunday against the Steelers. … Did the Clippers really misspell their own team name on their own media backdrop? I doubt it — has to be a Photoshop job, right? But it’s worth sharing just for Todd Radom’s quip: “They must be getting ready for the holiday season: No L.” … Saint Louis University’s equipment manager forgot to pack junior center Rob Loe’s #51 jersey for the trip to Washington, so he wore a NNOB #33 jersey last night (from Patarick Walsh). ”¦ New change kit for the Wigan Warriors (from George Chilvers). Agreed. Fantastic stuff. Its nice to see at least one exec Gets It. Agreed, agreed. What a cool guy. Outstanding. I may have to reconsider my dispassion for the Cards. Great to know “one of us” is on the inside getting it right. Nice interview. Thanks to Bill. I’m glad to see that the Cardinals are going back to the red cap and belt on the road, which is a look I’ve always preferred. 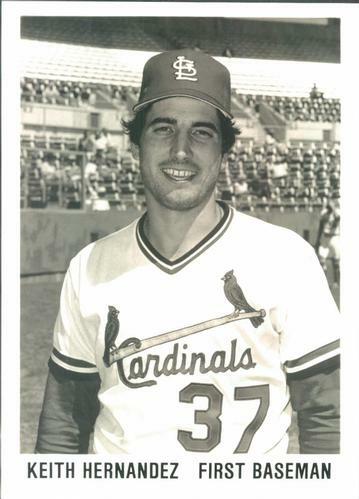 My recollection is that the Cards moved the numbers to their sleeves in 1979 and 1980 to highlight the birds on the front. I guess shrinking the numbers is another approach. Mad respect to Bill DeWitt. Also, remember the Cards went numberless on the front the year McGwire hit 70 hrs. I thought it was interesting when he said “So we made it a little smaller in ’98”. So small, you couldn’t even see it!!! FWIW, I’m partial to the navy away cap. Sad to see it go. Same here. I also wish they’d go back to a Musial-esque blue cap with red bill for home. I never understood why the Cardinals ever wore a navy cap in the first place. Plus the Cardinals wore red caps all the time when I started watching baseball so that’s what looks right to me. I can’t imagine the equipment manager is going to be thrilled about packing two full sets of batting helmets on the road. Honestly the Sunday cap never looked right to me, either. Who says they need to pack multiple batting helmets? They sure wouldn’t be the first team to wear a batting helmet that doesn’t match their hats. I never did care much for the Sunday cap with the bird-on-bat. I wouldn’t mind seeing it replaced by the navy StL cap. Cardinals have had a history of navy in their caps going back to the 1940. From 1956-63 they wore navy only cap. Red home caps came in 1964 with navy saved for the road. From 65-91 they wore red both at home and on the road. Then in ’92 they brought back the road navy caps which they’ve worn ever since this update. Gary, I know the history but that still doesn’t explain *why* a team named the *Cardinals* has a navy blue cap. If your team name is the Cardinals or Red Birds, you should wear *red*, not navy, not black, etc. The Cardinals could have a white, gray or navy cap & it would look good, but it still wouldn’t make sense. Yup. Red Holzman’s in there too. And you’ve got Basketball Hall of Famers Al Cervi and Bobby Davies in the front row as well. And they were owned by HOFer Lester Harrison. 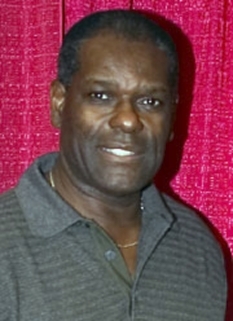 In total that particular team had four hoops Hall of Famers, a football HOFer and a Hollywood Walk of Famer. Not bad for a hick town like Rochester, New York. should be “Saint Louis University,” per university branding. St. Louis is a city, Saint Louis is a university. Always wondered: What’s a Billiken? So, basically, a precursor to the good-luck troll doll? it was a good interview today. I do remember that American Pickers with the Beech-Nut ad. Very cool interview. It’s always nice to see someone with the power to implement change is paying attention to uniform design. BTW, those Valvano tribute jerseys are fantastic. Great read! Being a designer I’d work for that guy any day…he get’s it! Loved the interview. Bill seems like a cool guy. Fantastic interview. DeWitt really does seem to be one of us . . . just a whole lot smarter. Damn, Paul. That might have been the best interview I’ve read on this site. Simply awesome. I’m not even a Cardinals fan, but Bill almost makes me want to be one. He certainly “Gets It” more than anybody working with my Braves. Thanks to both of you for that. Bill, keep up the good work. Agreed! Enough to quench my white-hot hatred of all things Cardinals after NLDS Game Five? No. But close. I have a lot of Cardinals fans in my family, and the interview with Bill almost makes me want to get back on the Redibirds bandwagon. Almost. Anyway, what I really appreciated was how, when pressed on decisions that I personally don’t approve, Bill was able to explain a sensible and consistent reasoning behind his choices. My only disappointment is that he seemed to have dismissed the orange-beak idea in the face of trivial resistance from MLB. Oh well. I won’t object to the wrong-color beaks if the whole script really does appear two inches higher in 2013! Agreed. Love that interview. Great job, Paul. Great read. As a Bucco fan I find it hard to want to like something about the Cards, but I also find it hard not to like ‘one of us’. Well played Bill. Great interview and so glad someone in baseball “Gets it”. I’d love to get a behind the scenes look from each team as to why they do what they do, especially my Orioles since I don’t know who was the lead on their retro/redux. Otto Graham played ten years of professional football and one year of professional basketball. He was a point guard in basketball and, as most sports fans know, was a quarterback in football. There are certain comparisons that can be drawn between those positions, obviously. In ten years with the Browns, he played in ten league championship games, and his team won seven. In one year of professional basketball, he played in one championship series, and his team won it. If I’m not mistooken, isn’t that Chuck Connors (TV’s “The Rifleman”)in the back row (to the right of the coach)? Sure looks like him…. Paul, props to you on this interview. Shows where you are at in the sports world when a team president is a fan and basically puts it out there he wanted to talk to you about the new jersey. Very good interview! To DeWitt’s point about the Cardinal logo look (yellow beak) and the whole “everyone knows the Cardinals are from StL”… My daughter thinks EVERY sports team whos mascot is a cardinal is THE St Louis Cardinals. I consider it a product of living here in St Louis. Northern Cardinals have reddish-orange beaks. I did a quick Google image search for “Cartoon Cardinals” — there are hundreds, maybe thousands of images. Just about all of them have yellow beaks. 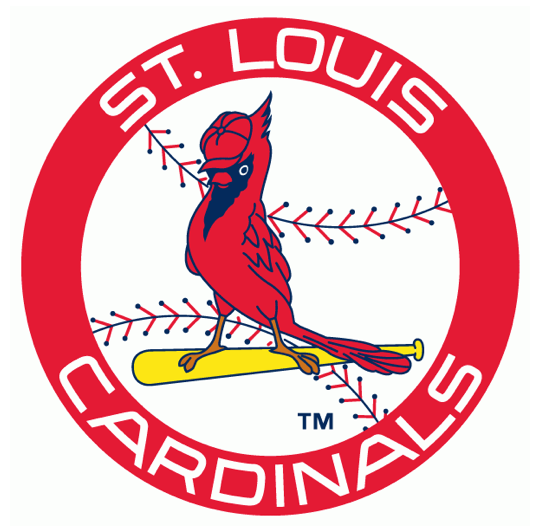 Is that because the St. Louis Cardinal logo is so iconic, that everybody copies it, or because cartoon cardinals just look right with yellow beaks? Some great uni specific clips in the John Riggins “Football Life” episode. Showed the Chargers using blue and yellow hash marks, torn jerseys and clear facemasks. Anyone get pictures? Clear facemasks…for the Chargers? During John Riggins’ career? That seems really odd. I was under the impression that clear facemasks pretty disappeared when the league started using the single and double bar masks in the late 50’s. I think I need to find and watch that episode. Not for the Chargers. The Chargers had the colored hash marks. The clear facemask was from Riggins childhood. Just uni observations by me during the eppy. Sorry for the confusion. Ah… ok, that makes more sense. I guess I’ll still watch it anyway. Awesome interview, Paul. Probably one of my favorites you’ve ever done on here. Did anyone actually read the story about the advertising on the police tape? It’s not as the ticker made it seem, it somehow ended up in the police cruiser and it was the first roll of tape the officer grabbed. Could be that the floor company installed a new floor at the police station, taped off the area and left the roll of tape laying there which in turn was put mistakenly into a police car. Or the police could be on the floor guys payroll and slipped it in there. Great interview, however I always thought that the Cardinal uniform was lacking some pop. What is wrong with using piping on both h and a jerseys? Give the eye something different. They didn’t have to go to an alternative jersey, just have the courage to go all in and redo parts of the uniform . He also made a good case for not having one supplier for unis. What can you do when QC issues come up? But I did enjoy reading DeWitt’s thought process and that a lot of ideas were considered. Y’know, in most cases, I’m all for piping, but nowadays most teams have it. So for the time being, I’d leave the Cardinals’ uniforms be. However if piping slipped out of fashion, I’d be all for putting it on the Cards’ and the A’s suits. Always go against the crowd! Better without piping. It’s great to see the Dodgers and Cardinals home white uniforms in the sun; they seem extra bright without any unnecessary piping. The crime scene advertising was a mistake, it says it in the article. The company uses it to tape off installations and somehow it got to the police vehicle. I wonder if there are other afficianados among baseball’s brass who appreciate design/detail/history as much as Mr. DeWitt does? If you’re out there, speak up. I might welcome a Tigers 3rd Jersey if it were done with this much love and care. Darin, the Tigers actually had a sharp alternate worn once in the mid 90s. The softball top? That was garbage. Boy do I hate the Cardinals. But damn, that guy is great. Fine interview Paul. Way to make the enemy likable! Gah! Remind me, what exactly is a change kit? That’s the silly term that soccer teams use for their alternate uniforms, instead of just calling them alternates. Just to clarify – Wigan Warriors are not a “soccer” team – they play rugby league. The first thing I thought of was Arsenal’s practice jerseys. Is that a Lucky Strike jacket in the background? I assume it’s some sort of auto racing thing. BTW, that was an awesome interview, Paul! I appreciate the NHL video…helps me get through my hockey detox. Hey Paul, that was an awesome interview. Best I’ve read on your site! 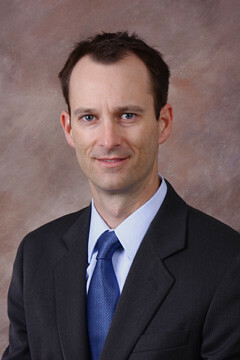 I would hope Mr DeWitt would be receiving a UW membership card soon….he certainly deserves one! And for those who do not know, Mr DeWitt’s grandfather owned the St. Louis Browns for quite a while in the 30’s. Best interview ever on this site. Simply amazing. But I have to agree with Paul, the yellow beak is a much better look than the ornithologically correct color. If the current government in Virginia is only willing to cut the grass on the side of the roads and highways twice a year, I wonder where the $150,000,000 will come from? More privatization of roads with a move to tolls? Relooking into privatizing the ABC stores (An idea that McDonnell’s fellow Republicans sneered at in this particularly partisan era)? If things are as tight financially as the politicians tell us, I don’t see how they scrounge up that money and keep the budget balanced. As a taxpayer, I don’t want to work just to pay off a bond for the Maloofs’s benefit. It may be possible that the Maloofs are so thoroughly obnoxious and their franchise so completely lacking in charisma that the usual Kevorka pro franchises have on government officials is nullified. Are there any cities left in North America desperate enough or stupid enough to commit hundreds of millions of dollars to bringing in a ball club, so they can be “major league”? Yes, but strictly speaking, the state doesn’t have to scrounge up $150 million. It just has to authorize a bond sale of that amount, typically with 15- or 30-year terms, and Virginia can borrow at some of the lowest rates of any state government right now. And then only a fraction of the total cost has to be paid back in any given year, and such deals are typically structured (at least in theory) so that expected new revenue generated by the facility or surrounding businesses covers the annual service payments. If done right, current bond rates amount to the markets offering states free money. Now, that doesn’t address the question of why the Commonwealth would consider using this free money to build an arena in Norfolk versus, say, building or repairing public infrastructure across the state. But there is something very close to free money out there for the taking if Virginia wants to do this. Total impact on taxpayers for that $150 mil could easily be less than $1 mil per year over the life of the facility. I understand the reasoning, but when a quarter of your state’s bridges and dams are considered hazards, and your state’s infrastructure gets a D+, how do you justify a bond issue for an arena, even if it’s cheap? And there are always promises of arenas spurring future development, which never bear fruit. Look at Houston: Minute Maid Park has been there for a decade, and it’s still mostly surrounded by abandoned buildings and bail bond places. Reliant Stadium is much the same. Also, it’s the Kings. Can you see anyone getting excited at the prospect of becoming the new hometown of the Kings? They’re about as exciting as a mayonnaise factory. Cort, I think I can safely assume from your comment that you’ve never seen mayonnaise being made. It’s not as dramatic as Hollandaise, of course, but definitely much more exciting than Kings basketball! I would rather see mayonnaise being made, or horseradish mustard, or really any condiment, than have to attend a Kings game. I have a friend who used to work at the Funyun plant in Saint Joseph, Missouri. He said it was a scintillating place to be. “John was coming off a double shift. He worked nights at the Funyun plant in Saint Joe” always struck me as a really good opening line for something. Oh, man, that’s the start of the back-cover blurb of a stoner comedy-noir detective novel, is that that is. It’d make a great start to a NaNoWriMo project. Part of the problem with the bond would be that could one trust the Maloofs to still be in the Tidewater area when that bond hits maturity? While many sporting venues haven’t spurred development in the immediate area, they will likely tout the Phone Booth in D.C.. Granted, it benefits from having a Metro stop and being near other areas of town, but the change there has been dramatic. They’ll sell that if they have to win over politicians and the public. As a former hampton roads resident, i dont see any majorleaguesport workingthere except the nfl. Great interview … but for someone who cares about uniform issues, the man’s awfully phlegmatic about players wearing pants around their shoe-tops. Whether or not he’s empowered to dictate such things, does he have NO ability to lobby them on the subject? Its easier to be phlegmatic when you have actual responsibilities. Its easy for us on the internet to say “If I were in charge, this is how things would be”. When you’re actually in charge and can’t do everything, you pick the important things. As he says in the article, life’s too short to win every battle. “NY Yankees.” [Slight pause.] Wait, they don’t actually do that – they’re “NY NY.” Which is one of my problems with the Yankees. Technically, isn’t mail sent to New York City as “New York, New York”? Or is that just for Manhattan? Which wouldn’t apply for the Bronx. Personally I have no problem with putting city initials or city names on home jerseys. Correct; “New York, NY” is the mailing address for Manhattan. Yes New York, New York only applies to Manhattan. Thanks Mr.DeWitt for Getting It! Gosh, a cap logo of a team initial in the shape of a footprint with little pawprints above. I suppose we have to be generous and assume that nobody at either the Ems front office or Brandiose was aware that New Britain has a minor league team. Which to be fair I wouldn’t be if the Rock Cats weren’t a Twins affiliate. Loved the interview…the Cardinals usually had larger front numbers than most teams…even bigger than in that Gibson picture. They look too small to me now. Having St. Louis on the home and not the road bugs me…but at least he has a rationale. I really think Majestic is not the best supplier and he mentioned several problems they caused. They can’t get the Mets script right for anything…first they really exaggerated Wilpon script, now the e is too fat. Rawlings never seemed to screw these thing up…ironic, as they are based in St. Louis. was just checking out Deadspin and noticed that there is an article about Sports Illustrated colorizing a photo of the Baylor/Kansas St. game. The picture in SI shows green jerseys when the team wore black. The best part? The commenter asking if Paul Lukas is now the editor at SI. Gah, these Notre Dame BFBS uniforms are bad. Put aside the BFBS issue…black numbers trimmed in green? And not a light green? White numbers would have been acceptable, or even navy numbers trimmed in gold. Further observation indicates that the lettering is navy. Doesn’t make it any better. Is this what we have to look forward to with the NBA in Christmas Day? Oh joy. I think the “Cippers” logo is photoshopped. It’s suspicious looking to me. As others have said, really nice interview. If you ever talk to Magic or one of the other Dodgers owners, ask them about how the Dodger logo, numbers and letters all seem to have shrunk since Fox-McCourt years..
Ahhhhhh yes, the Ravens go black/black/black. So wonderful!!!!!! Rutgers in mono-black with the Black R on chrome helmets. Yuck. Also doing the “F.A.M.I.L.Y” on back. Double yuck. Re: the Canadiens skate plaque: Didn’t Dickie Dunn have one (maybe a Flyers one?) in his home office in Slap Shot? it’s a shame that Saints didn’t go with their old gold pants against the Falcons in the throwbacks. If Kings move to Virginia, will the re-name themselves the Queens? Maybe just go back to Royals? I didn’t realize how much the Birds on the Bat has changed over the years, such as their beak color, the position of their tail feathers that’s sometimes behind or in front of the bat, and the detail of feathers on the wing and the crown. Great to see Mr. DeWitt and the Cardinals taking Majestic to task for their mis-positioning of the logo! What I can’t understand is this: you never see front logos or back numbers positioned too high; it’s always too low. Why would this be?